No shower, just a bath tub. Bring your own towels. Propane refrigerator. Not full size, but larger than a dorm-size. Drip cones (size 2 filters), French press, and stove top percolator. We stock the cabin with basics at start of the season (salt, pepper, oil, some spices, sugar, flour) and ask that you replace what you use. 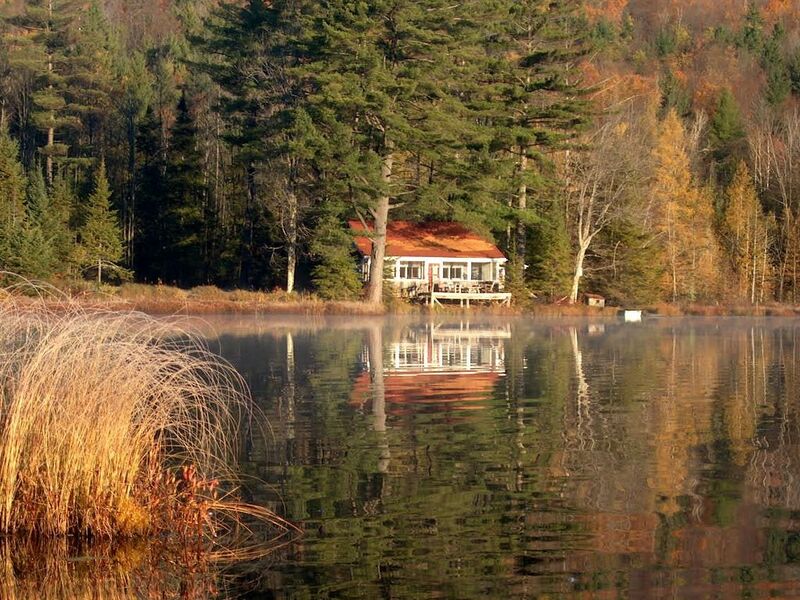 Utterly charming cabin surrounded by lots of Vermont-y goodness! We thoroughly enjoyed our stay on Cobb Pond. Loved the on-site hiking trails, wildlife on the pond, and how quick and easy it was to get into town while still feeling worlds away. Wish we had brought our telescope as the deck made for lovely star gazing. Thank you Kathy and Steve! It was a pleasure to host you. Thanks for leaving the cabin so tidy. You are welcome back anytime! The property is at least as good if not even better than the photos of it. The owners were very responsive and helpful. The property has a very remote feel yet shopping options are very close and easily found. Secluded, rustic, very clean, wildlife abounds. We spent a week in the woods at our very secluded little slice of wonder. Mr. beaver swam across the pond each night between 6 & 6:30pm. For nature lovers the bathtub was just wonderful, a full view of the lake as you rekax in the tub. We spent lots of time on the screen porch reading and just talking, it was like having an HD-TV view of the pond. Both Derby & Newport are just minutes away for a piece of civilization. Unfortunately we use Verizon wireless and were able to get reception. Do yourself a favor, get unplugged and stay here, you will live it. A bit off-the-grid, but worth it! Enjoyed our stay at this beautiful, secluded cabin. Clean and comfortable, and the whole pond to ourselves. Our hosts were accommodating and communicative and made squaring away the logistics of arriving and propane heat easy. Would definitely come back! This cabin rental is an ideal place for a secluded getaway in nature; the lack of power and cell phone signal proved to be a benefit. The only evidence I had of other humans for several days was the occasional far off sound of a motor running. The woods surrounding the cabin are peaceful, but full of delightful surprises. The old farmhouse and old orchard are wonderful areas to explore. The pond itself if larger than expected and entirely private. I massively enjoyed rowing around while looking at the trees and the wildlife. I was there only with my girlfriend, but the cabin could easily sleep more. My main regret is that I did not book more time -- something I intend to remedy next year. We really loved going here! As a fan of screened in porches I enjoyed being here immensely!!! We did go into Newport to check out the scene and recommend a spin by the library. But, really it is all about the peaceful surroundings at the Pond! Lots of nature and so relaxing- wish we could stay longer! Want to get back for another Season!!! We require a $200 security deposit that is refundable barring any necessary deductions. Half of rental fee is due at booking and the balance is due May 1.